Today, the Federal Family and Medical Leave Act is turning 25. It has protected millions of families from losing their livelihood and stability during times of need – serious illness or welcoming a new child. But how many millions are still left out? About 40% of the workforce is excluded from FMLA’s protections. This means that when their parent has a stroke, their partner has a baby, or their spouse is injured, they can be fired for taking time off, or be forced to forgo leave when they need it most. Legal Aid at Work’s Work and Family helpline hears from over 1,500 people a year facing these impossible choices. Alfonso called us when he was about to celebrate his first father’s day. He was stressed. His new daughter had complications and required daily trips to the doctor in the first weeks of her life. He wanted to care for his partner and new baby, but his boss would only allow him to take 2 weeks off. He worked for a towing company with about 30 employees – so he was not eligible for job protection under the FMLA which only applies to employers with at least 50 employees. He went back to work, was denied the opportunity to use his California Paid Family Leave benefits, and had to leave his brand new baby with relatives he paid to drive her to her appointments. He worried all the time and knew there was nothing he could do to get back that time with his new baby. 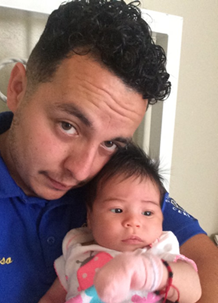 Thankfully, Californians are celebrating the New Parent Leave Act, effective January 1, 2018, which allows up to 2.7 million more new parents like Alfonso to take 12 weeks of bonding leave without risking their jobs. This year Californians are also welcoming an increase in benefit amounts under California’s Paid Family Leave and disability insurance programs. But, only 5 states and DC have paid family and medical leave programs. And only 14% of workers have access to paid family leave from their employers. So, whether hardworking families are able to care for their loved ones depends on where they happen to live and the particular characteristics of their employers – creating inequities across the nation for families facing serious health conditions or bonding with new children. Family and medical leave changes lives – babies have improved health and developmental outcomes, family members have reduced hospitalizations and get well faster. Every child should have time with her parent in those critical early moments. And every child should be able to care for his seriously ill parent – without risking their jobs and income. Support the FAMILY Act and help working families keep their jobs while caring for each other and meeting their families’ most basic needs.